I have for some time been intrigued by the idea that if you dispense with the spiritual concept of the soul, then a biological explanation is required to explain the experience of individual consciousness. The theory suggests that what puts me inside this body and everyone else outside of it is a unique alignment of genetic, biological and electro-chemical conditions, or at least almost unique. The law of averages suggests that no matter how complex these conditions are, eventually, inevitably, they will reoccur, and you thus effectively have a form of reincarnation. Given the very specific nature of the biological conditions required effect this condition, the likelihood is that this biologically reincarnated being would bear a striking similarity to the one that preceded it, both physically and in aspects of their personality. But the most interesting element of the theory concerns the inevitability, especially as the world population increases, that sooner or later these biological conditions will occur in two places simultaneously, which raises the question of just what that would mean for the experience of consciousness for the affected person. I shudder to think what Hollywood would do with the concept of two people of similar name and identical appearance born at the same time in different countries – a mistaken identity plot involving shifty Russian agencies and CIA operatives no doubt, and the two central characters would have to be radically different in personality, the meek librarian forced to flee when they are mistaken for the ruthless assassin. And it would be revealed in the end that they were actually related, separated at birth by a cruel twist of fate. Oh lordy. But in the hands of Polish maestro Krzysztof Kieslowski it forms the core of one of his most enigmatic, mysterious and beautiful films, and one in which the storyline is subservient to character and a fascination with life's small but precious moments. This is first realised in the early close-up of the initial central character Weronika, singing her heart out as part of a group that disperses the moment that rain begins to fall. All except Weronika, for whom the sensation of rain on her face appears every bit as joyous as the music that we learn is central to her world. A singer of considerable talent, she is on the first rung of a possibly successful career when, at her first major public performance, she has a heart attack and dies. Over in France, meanwhile, a woman of identical age and appearance named Véronique works as a music teacher and also has the talent to become a professional singer, but something is holding her back. Could it be her concerns over the results of her recent electrocardiogram examination, the fear of a heart attack combined with an inexplicable sense of loss she has recently begun to experience? 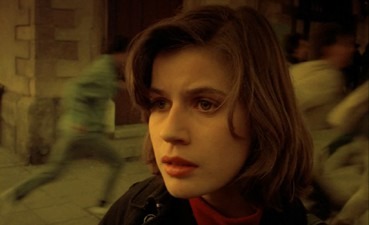 Kieslowski keeps the parallels between the two lives largely subtle, the small sparks in the first third of the film intermittently resonating in longer second portion, suggesting an almost supernatural connection of the sort often associated with twins, one stepped up a gear by Weronika's untimely death. The two never meet, but come aching close to doing so early in the film in an electrifyingly staged sequence in which Weronika catches sight of a tourist coach that is being boarded by her doppelganger, who cheerily takes pictures through its window as it departs, unaware that she has captured an image that will haunt her later. This moment provides a springboard for a number of only hinted-at connections between the two, but also a rationale for them owning the very same clear plastic ball, something they no doubt bought in the same Polish city. This jointly owned object becomes at one point almost a memory conduit, when images distorted through Weronika's ball and the flawed window on the train in which she is travelling later find a home in Véronique's troubled subconscious. An intriguing development in itself, Véronique's fascination with a puppeteer who visits her school and the games he plays to draw her to him provide the most literal recognition of the parallels between the two lives, first through a marionette show that almost mimics Weronika's on-stage death, and later with the suggestion of a new work using dolls that have been modelled directly on Véronique, which perhaps spells things about a little too literally for an audience that should really be able to put the pieces together themselves. The plot takes us nowhere conclusive, but this curiously never seems to matter. Get two or three fans of the film together and they talk primarily not of narrative but of their delight at specific moments – the near meeting of the two women, the subjectively shot heart attack, the post-death out-of-body flight over the audience, the church distorted by a train window, the reflected light that dances around Véronique's room, the tape that tells a story through sounds and ends in possible death, Véronique's first face-to-face encounter with her own marionette... I could go on and on. Really. In the dual central role of Weronika and Véronique, Irène Jacob is positively radiant, capturing the love of life that unites both characters and their subsequent physical and mental pain with spellbinding conviction – just thinking about her expression of unbridled joy in her close-up as Weronika as she sings in the rain (no film pun intended) makes the hairs on my neck bristle. 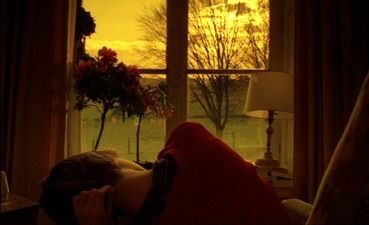 And as has been almost relentlessly documented, this was a transitional film for Kieslowski, the dual locations and languages marking his move from the socially and politically influenced Polish films to the lyrical Three Colours trilogy he was soon to make in France, films with which Véronique shares stylistic and thematic ground. It's not going to work for everybody, and with its opaque storytelling, its focus on the small detail at the expense of the big story and its heavily tinted visuals, it will provide plenty of ammunition for the anti-art house crowd. But for those open to the idea of cinema as more than just a vehicle for a rattling tale, as a tool for the expression of emotion through visual and aural experience, The Double Life of Véronique is a work that absolutely has to be experienced, appreciated, and cherished. Artificial Eye have clearly licensed this two-disc package from the French MK2 release, and thus it is they who deserve the largest slap on the back for this lovely transfer, which copes with the film's heavy tinting handsomely and demonstrates exceptional contrast and levels of detail. It really does look better than I've ever seen it outside of the cinema – only in one night time shot were compression artefacts obviously visible. The picture is framed 1.66:1 and anamorphically enhanced. When we screened the film print almost ten years ago (was it really ten years?) I was particularly struck by the extraordinary quality of the sound mix – I'm not talking flashy use of surrounds, but the sheer clarity and fidelity of the sound in many of the scenes – it remains one of the best soundtracks I have ever heard in a cinema. It was no small joy to have that experience repeated here. The Dolby 2.0 stereo track is very impressive, but the 5.0 track is the one to go for to really recreate the cinema feel, with key sequences – Weronika walking out into the square and colliding with a passer by, the tape she is sent as a clue to a proposed meeting, her arrival at the railway station at which this meeting will take place – sounding absolutely gorgeous, with the surrounds nicely used for complete emersion in the life and activity of the locations. An excellent job. Also licensed from MK2, the extras are all on disc 2 and will prove priceless to anyone interested in the cinema of Krzysztof Kieslowski, which frankly should include anyone who really cares about cinema. All have optional French or English subtitles. Conversation with Kieslowski (52:40) was made in 1991 for French TV and is structured around an extensive interview with the director and invaluable behind-the-scenes footage of the filming and editing of The Double Life of Véronique. Kieslowski discusses some of the themes of the film (though not, thankfully, in overly explicit detail), the collaborative approach with his regular co-scriptwriter Krzysztof Piesiewicz ("Piesiewicz cannot write but he knows how to tell a story"), his decision to abandon documentary for fictional features and how that has affected his approach to film-making ("Everything has to be fake in order to look real on screen"), his own early influences and his experiences with Polish censorship. One of my favourite sequence reveals how the out-of-body shot was done. There are a lot of extracts from the film included, usually to illustrate points under discussion. Interview with Irène Jacob (16:42) is shot largely in one big close-up, only briefly interrupted by very short extracts from the film. The actress is very talkative about the landing and preparing for the dual role and working with Kieslowski, who encouraged her to create specific mannerisms for each character in order that the audience recognise subtle differences between them. She also hints and a fair amount of footage that was shot but cut from the final edit of the film. Kieslowski, Polish Film Maker (30:35) provides a very dry but detailed history of modern Polish cinema and specifically Kieslowski, through his early documentary work through to his later features. At times it has the feel of a French Open University programme, with phrases like "Let us look at these two films in more depth," followed by a film school style analysis of particular scenes. But it IS interesting. The final section, Short Films, contains four such works spanning 22 years. The 1958 The Musicians (10:07), a simple but acutely observed record of steelworker orchestra in practice, was directed by Kazimierz Karabasz, who taught Kieslowski at the Lodz Film School in the 1960s. The film was a big influence on Kieslowski's own documentary work and was one of his top ten films. The 1970 Factory (Fabryka 17:30) was one of the first films made by Kieslowski on leaving film school and the influence of The Musicians can be clearly seen in this intriguing observational look at the problematic discussions between workers and managers at a Polish factory that acts almost as a microcosm of the problems inherent in the Polish political system of the era. Kieslowski's 1976 Hospital (Szpital 20:28) covers a single 24 hour shift on a wing at a busy hospital can't help but have a ring of Frederick Wiseman about it, echoing that director's own 1970 film of the same name. The 1980 Railway Station (Dworzec 2:42) was one of the final two films Kieslowski would make for the WFD studio, for whom he did most of his early documentary work. Each of the films has a useful textual introduction (in French with English subtitles) and are framed 4:3. It's difficult to be objective about a film that provokes such a personal response as this one, and I don't feel inclined to try. The Double Life of Véronique is never going to connect with an audience who like their stories loud and obvious and with a clear conclusion, but I, frankly, could care less. For my money this is one of the most beautifully realised works by one of cinema's true artists, a film that stimulates the intellect but also touches the heart. And how. Artificial Eye's 2-disc DVD release, licensed from the French MK2, is bloody marvellous, the superb picture and sound supplemented by a very classy and well chosen set of extra features. Very highly recommended.